In this podcast I’d like to talk about the implications of team size on social interactions and coordination within, and between, organisational teams. Team Size: Friend or Foe? If you continually struggle to manage your email Inbox, or if you hold any kind of leadership role, this article may be of interest to you as it helps to explain how team size impacts you and your team. In the past we’ve tended to visualise organisation structures hierarchically, as business units, functions, teams, and work groups, in some cases, we still do. Consequently, when thinking about composing teams, we tended to pay attention to spans of control, perhaps following a rule of thumb, or existing organisational norms. However, hierarchical structures, like this, are largely an artefact of the command and control era, and this no longer reflects the way that teams and groups in contemporary matrix organisations operate in practice. …explains the nature of interactions between two entities (actors). In this context, actorscould be people, teams or groups, functions, organisations, processes, IT servers, network nodes, and/or software applications. In other words, Bossard’s Law influences all things that interact in dyadic relationships, i.e. between two parties. This is the basis for social network analysis and it explains, for example, why your LinkedIn relationships multiply as you add connections. The problems for teams is that the relationship between team size and interaction volume is exponential. So two people have one interaction. The more people you add, the greater the number of interactions generated, and it doesn’t take long before interaction volume is overwhelming and leads to coordination loss (failure cost). Obviously machines are created to handle high transactions volumes whereas people can generally only cope with an interaction volume of about 100, which approximately equates to a group size of about 15 individuals. Therefore, interaction volume is 3. But, group structures in matrix organisations and virtual teams can be much bigger than this….which is where the problems begin. Although much depends on the nature of work complexity, the impact of this interaction volume on matrix organisations is profound because the nature of interactions in such organisations are more complex than the example given above, i.e. 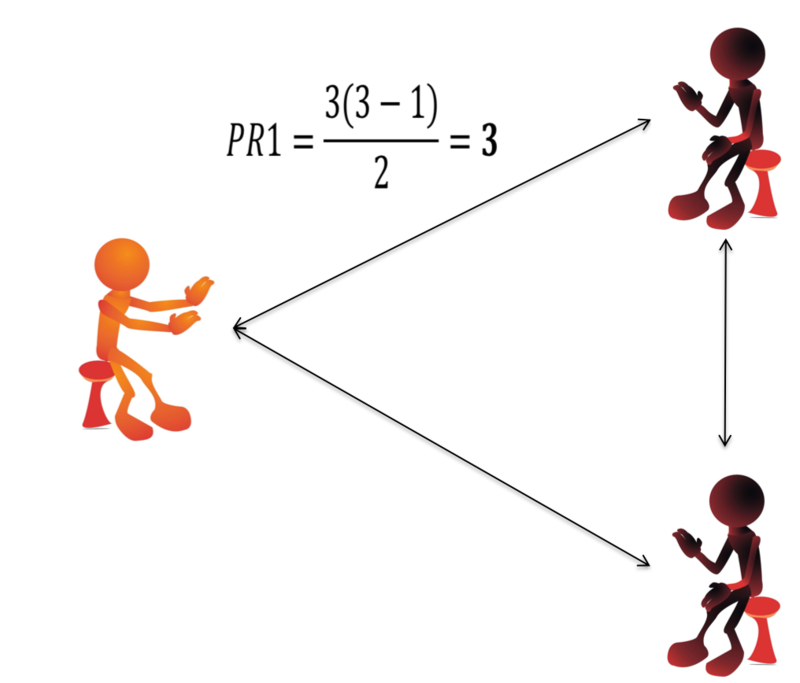 interactions tend to be between and within groups(which is a different equation of Bossard’s Law).